Panoramic view of Muelle de Industria in Sta. Cruz from Intramuros along the Pasig River, showing the Juan Luna Building surrounded by old friends like El Hogar (left), and newer neighbors like the drab mid-1960s office buildings to its right and rear. Few office buildings in the Philippines are acknowledged as historical structures. Fewer still have historical markers placed on them by the National Historical Commission. There is one that has been given an Araw ng Maynila Award by the Manila city government, which is given to persons, not buildings, for being the best example of architectural renewal in the inner city. This is the Juan Luna Building in Binondo, found on the corner of Muelle de Industria and J. Luna Street, which has recently undergone a restoration led by Augusto Villalon. Finished in 1924 as the Manila branch office of the First National City Bank of New York, the building faces the Pasig River just a block away from Jones Bridge. Its next-door neighbor is another famed historical office building—the El Hogar Filipino building built in 1914 by Ramon Irureta-Goyena and Francisco Perez-Muñoz. Designed by American architects Henry Killam Murphy and Robert Henry Dana, Jr., the Juan Luna Building was originally a joint venture between the two biggest American companies operating in the Far East: the International Banking Corporation (IBC, the international holding company that operated the City Bank branches outside the US) and the Pacific Commercial Company (PCC). Apart from the Manila branch office of the First National City Bank (now called Citibank), the building also housed the offices of the PCC, the biggest of the American-owned comprador companies that handled the export and retailing accounts of the Canlubang Sugar Estate, International Harvester, Manila Cold Storage and Manila Hotel. 1924 feature on Juan Luna Building in The Philippine Free Press upon its inauguration. Built in the Beaux-Arts style favored by banking buildings in the US during the 1910s to 1920s, the Juan Luna Building followed the standard template of the various Asian branches of the bank like those in Shanghai, Hankow, Beijing, Guangzhou and Tianjin. The Beaux-Arts design had various Neoclassical motifs, such as monumental columns, a simplified entablature incorporating columns, Ionic capitals, an empty frieze where the bank’s lettering was emblazoned on the façade, moldings between the main façade and the attic, and a decorative band in the attic cornice. Its square façade is dominated by six Ionic columns on each exposed side that divided the windows into seven bays, with two pylons on each end. Standing six storeys tall plus a rooftop promenade, the Juan Luna Building dominated the Pasig River from the 20s up to the 50s with its Neoclassic detailing and fortress-like mass. Lording over this bustling riverside scene for nine decades, the former City Bank building now rejoins the living city via its reincarnation as a BPO center. The building’s extensive use of reinforced concrete allowed it to survive the pummeling the district went through during the 1945 Battle of Manila. It also housed one of Manila’s first elevators, as well as the earliest electrical air-conditioning units. True to the “riverside aesthetics” of putting elegant “houses of commerce” along the city’s main river, which was used as a major artery for freight age and travel, Manila in the pre-war years thus boasted its own version of Shanghai’s The Bund district. The Juan Luna Building served as one of the key landmarks to this bustling but classy commercial waterfront, facing Intramuros and the equally Neoclassical Manila Post Office Building. The Juan Luna Building was considered one of the most posh addresses of this riverside commercial district. The Juan Luna Building was considered one of the most posh addresses of this riverside commercial district, where major figures in pre-war commerce set up their offices. One of these major figures was National Artist Fernando Amorsolo, who used to work for Pacific Commercial as a graphic artist under the venerable Horace Pond. In the post-war years, major law firms like that of Ponce Enrile, Siguion Reyna, Montecillo and Belo held court in its upper floors. It would not be until 1972 that the now renamed Citibank would move their offices to Makati, leading the general exodus of the remaining big-named companies to that district. Manila’s riverside was left with empty and decrepit buildings, neglected and left to squatters. By the 70s, the pre-war cascos that romantically dotted the Pasig River were also replaced with moored fuel barges and privately owned tugboats that still litter the building’s waterfront to this day, resulting in an unkempt and generally disheveled—if not dangerous—appearance. The ground floor today where the City Bank branch used to hold court. Future plans call for a fast-food center to operate here to maximize community interaction between the building users and the public. Had it not been for the building’s illustrious origins, the Juan Luna Building would probably have been felled by the wrecking ball in the 80s or 90s. Its topnotch façade and genteel location, however, assured it a different fate. By 2000, its façade was still intact, but its internal floors were badly buckled and cracked due to decades of overuse and neglect. Its newest owner then wanted the building redeveloped as a Business Process Outsourcing (BPO) center, and fortunately, the building footprint was ideal BluPrint 55 for this conversion. Having a square plan with no internal atria or courtyards meant that the interior could be gutted and re-floored to maximize its 2,118-square meter building footprint, creating 10,000 square meters of usable office space. While the contractors under Jose L. Berenguer III worked on modernizing the interiors, a separate contract for refurbishing the façade and creating a new seventh floor “penthouse” was awarded to architect Augusto F. Villalon, principal of AVillalon Architects. This project was done in association with architect Melvin Patawaran of Tropiks Design Studio, and with the Del Rosario Design Group, Inc. as retrofit architects. With heritage conservation deeply ingrained in his design consciousness and planning, Villalon cleaned and restored the façade from nine decades of urban grime by sandblasting the concrete. He was rewarded with a surprisingly stable and mostly undamaged exterior fabric—the only signs of visible wear were the disappearance of several bust portraits in the now-empty medallions on the lintels of the corner pylon windows. But everything else, like the rustication lines on the ground floor, the balustrade details on the bay windows (now colored green to accent it from the rest of the cream white façade), the dentils on the entablature and even the palmtree scroll-and-plate moldings on the top-level cornice have all survived remarkably well. Two views of the Juan Luna Building’s façade. On the left, the J. Luna Street side shows the elegant combination of white and green that enlivens and updates the structure’s Beaux Arts features. On the right, the attic and rooftop pavilion level at the corner of J. Luna and Muelle de Industria, their raking lines giving an impressive view over the Pasig River. Note the Manila Post Office building in the background across the river. Villalon pointed out that the composition of the concrete moldings was interesting, in that it used a kind of fine white river sand that is no longer available—most likely harvested from somewhere in the upper reaches of the Marikina River. The seventh floor penthouse level, also to be given over to BPO offices, was designed by Villalon with a light touch of Bauhaus Moderne for the roofdeck level. By creating a continuous glass curtain from floor to ceiling framed by an anodized steel frame, Villalon exposes the surrounding cityscape from the vantage point of this rooftop floor. In return, the evocative beauty of its surrounding architectural heritage is brought to attention: the sadly decrepit and uncertain fate of El Hogar next door, along with the old Hong Kong and Shanghai Bank building further down J. Luna; the condemned Bauhaus-styled Manila Press Club Building of Angel Nakpil across the river (to be replaced by another grotesque skyscraper); the uncertain Manila Post Office building down the river; and the tottering ruins of the Intendencia Building in Intramuros. 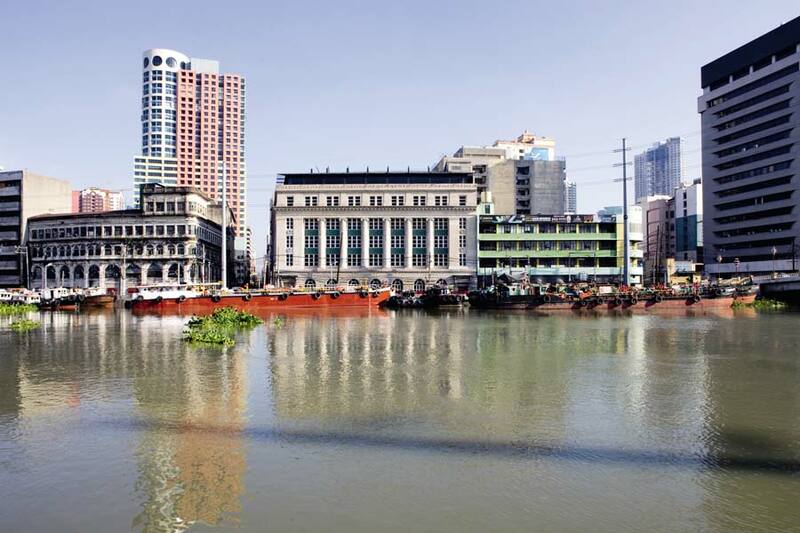 There are visible victories in the name of conservation, of course—the continued upkeep of the Manila Chamber of Commerce Building just across the river is one rare example. And then there is this building, of course. Reviving the heritage of this district by making it relevant to today’s needs is the buzzword. Thus, not only is the Juan Luna Building’s internal floors necessarily remade in the same anonymity as any other office box. There is added value in the façade’s regal appearance. The ground floor section where City Bank’s retail branch used to hold court is now being planned as the building’s fastfood center and canteen, one that Villalon hopes will not only be realized, but also restore the interaction made between structure, building user and outside pedestrian. Its planned main entrance will be the symbolic corner entrance facing the Pasig River decorated by the Neoclassical detailing, made possible by dreams of imperial glory a century ago. It is hoped that its ground floor arched arcade will once again ring with the sounds of youthful laughter and kibitzing that constitutes the mainstay of the BPO workforce, so that this regal riverside palace will once more live as an integral part of the city’s social—and designed—fabric. Top: Sketch of dining lounge envisioned for the ground floor. Bottom: Perspective of fast food outlets for the ground floor. This article first appeared in BluPrint Vol 6 2013. Edits were made for Bluprint.ph.